Dorothy apologises for causing trouble for Kerry. Dorothy feels off-colour and ends up fainting on the Mangels' floor. Dorothy is in a hospital bed - Beverly tells her that she's been very dehydrated. 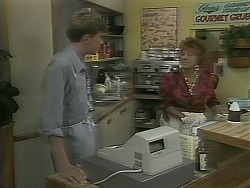 Beverly suspects food poisoning and they go through what Dorothy has eaten lately. Lochie opens the door. LOCHIE: She's not dead is she? They laugh and continue to talk about Dorothy's food intake. Beverly says she'll do some tests - and Dorothy will have to stay on the drip until tomorrow. DOROTHY: I'm afraid I'm a difficult patient. BEVERLY: Ah, that's alright. I'm a difficult doctor! Some girls at the table are trying to tease Ryan, but he's up to it this time and answers them back well. Todd, Melissa and Josh come in - Josh and Melissa have got through the first round of the school quiz. Josh and Melissa seem to be getting along well. Todd looks a bit put out. Jim comes in and Beverly immediately starts on him about Matt leaving his stuff around the house. She's rather be doing her research. Jim keeps calm and says that he doesn't like seeing her so stressed and Beverly snaps that if the family pulled their weight she wouldn't be so stressed. Jim bites his tongue and instead says that Helen will be back soon to help out. Jim says he's really sick of arguing - he wants them to treat each other with kindness. BEVERLY: I'm willing to try. And not just because it might bring Helen home. DOROTHY: Wouldn't it have been nicer if the princess had forgiven her? LOCHIE: Oh, she forgave her. Once she was dead. She was a very kind princess. 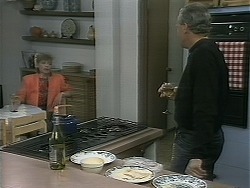 Beverly comes round to tell Paul that Dorothy has food poisoning - and it could be something she ate at the Brasserie. Apparently two other patients had a stomach upset too and the connecting factor seems to be ham and eggs at the brasserie. Paul doesn't seem to concerned and tries to dissuade Beverly from running tests on the other two patients. Beverly is shocked and says that she can't ignore the situation. Paul says he expects a bit more loyalty from his employees, but Beverly points out that she bent the rules for him once before with Gail and paid for it - she won't do it again. BEVERLY:(angrily) You are asking me to turn a blind eye to a serious situation. And I'm damned if I'm going to do it for you! MELANIE: You're being so sweet. So considerate. Not at all like you usually are! Josh and Melissa have been conferring about the quiz and Todd feels very left out. He tells them off for being big-headed. In the background, No.30 is up for sale. Paul comes to see Jim. He tells him about the salmonella outbreak and how Beverly is running tests. He wants Jim to talk Beverly out of doing the tests - he's worried that the hotel will lose trade if they are censured by the Health Department. Jim agrees to have a word, but can't promise anything. JIM: When it comes to ethics, my wife is a very strong-minded woman. Melanie has brought Dorothy some flowers. Dorothy is quite suspicious that Paul has given Melanie time off to visit her(!) But she goes on to tell Melanie about other exotic illnesses she's had. Melanie mentions that two other people are ill and Dorothy gets even more suspicious! Ryan asks Gloria if he can leave early to visit Dorothy. At a table, Josh tells Todd and Melissa that he's been trying to get into the Lassiter's computer. He could book a suite and they could have a party! A bloke called Shaun comes in and mocks Melissa and Josh about the quiz. Todd anger over the quiz boils over and he storms out. Melissa follows Todd out but she can't stop him storming off. Melissa tells Josh that she thinks the quiz talk is giving Todd an inferiority complex. Beverly has had another two cases of food poisoning - and again they ate the ham at the Brasserie. That's five people in all but Paul is still trying to shrug it off. Beverly says she'll have to reort her findings to the Health Department. PAUL: Go on then. Ruin the hotel's reputation. Just then Melanie comes in and Paul tells her off for taking such a long time. He is aghast when he hears that Melanie has told Dorothy that other people are sick. BEVERLY: Paul, you can't sweep this under the rug! Salmonella poisoning is a serious thing and if it hadn't been for prompt treatment, Mrs Burke could have died! PAUL:(angrily) But she didn't, did she?! And nothing further would have come of this if you hadn't ordered those damn tests! Beverly gets home to find that Jim has prepared dinner for her - all part of his new peace-keeping plan. They talk about Paul - Beverly can't understand why Paul expects her to put aside her medical responsibilities just because Paul is a member of the family. Jim tries to speak up for Paul - Paul is concerned that he might have to lay off staff. Beverly says it's more likely that Paul is worried about his profits. She's angry again (doesn't take much with her!) and warns Jim not to gang up on her with Paul - they did it before with Gail. BEVERLY: Paul is at fault here and he is damn well going to bear the consequences! Paul has come to visit Dorothy. He tells her that they'll pay for her room and her hospital fees. Dorothy says that she's thinking of suing the hotel. PAUL: I feel I should warn you that I represent a very, very large corporation. I've got enough money and connections behind me. I think if you take me on, you might just come off second-best to say the least. DOROTHY: Now who's making threats? I suggest you leave, Mr Robinson. I really don't feel like coping with someone like you at the moment. But when I have fully regained my strength, you'll find that I don't frighten easily. DOROTHY: Please go, before I call someone and have you removed. Ryan has heard this whole exchange from the door. 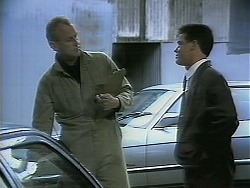 As Paul leave, Ryan tackles him. RYAN: I guess it takes a lot of guts to attack a sick woman, too weak to defend herself! PAUL: Oh yeah? You've got to be joking, haven't you? It'd take a bulldozer to flatten her. RYAN: If you want to pick on someone, try me. PAUL: I wouldn't even bother discussing business with school-boys. RYAN:(pushing Paul up against a wall) I may be just a school-boy - mate - but I know how to deal with slime like you!